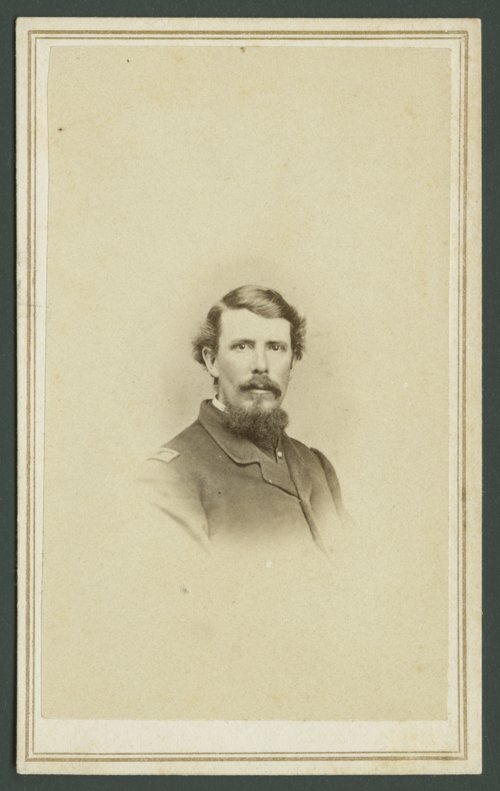 This is a carte de visite photograph showing Wyllys Cadwell Ransom dressed in his military uniform. He was born in Townshend, Vermont, April 28, 1828 to Epaphroditus and Almire (Caldwell) Ransom. Ransom graduated from the University of Michigan and later studied law. In 1857, he accepted a position in the office of the surveyor-general of Kansas and Nebraska and was appointed chief clerk. Ransom served in that capacity until 1860 when he was placed in charge of the United States land office at Fort Scott, Kansas. At the beginning of the Civil War he organized Company E of the 2nd Kansas Cavalry. Later, he organized the 6th Kansas Cavalry and made major. By order of general Blunt he was given special command in the field embracing all the western portion of Missouri and Arkansas, with three companies of infantry, three of cavalry and a section of artillery. After serving in active service for two years he moved to the staff of General Samuel B. Curtis and served as judge advocate and commissary of musters until the close of the war. After the war, he was elected president of the Kansas City & Cameron Railroad. On leaving this office he returned to Lawrence, Kansas and was appointed assistant treasurer of the Leavenworth, Lawrence & Galveston Railroad Company until the company went into receivership. Soon after, he was appointed auditor of the Chicago, Lake Huron Railroad. Ransom married Mary E. Mottram and they had seven children. He was active in the Masonic Lodge and Lawrence Board of Education. Ransom died February 1, 1908 in Grand Rapids, Michigan.